Stop throwing out your vegetables! I have a pet peeve of letting food go to waste. Unfortunately it happens a lot, especially with fruits and vegetables that I buy. My boyfriend does not like fruits or vegetables, so it is always just me that eats them. When I go shopping, I keep this in mind and only buy what I know I will be able to eat within a week or two. But it seemed that I could never eat the food fast enough and I would always end up with wilted lettuce, and rotting fruits and vegetables. I tried to store them in different kind of containers, and freezer bags. This seemed to help, but only saved them for a day or two more. I could not take it anymore, I thought to myself- “I work for an appliance parts company, there has to be something out there that helps food last longer.” I went to work the next day and asked around. As it turns out I was right, there is something out there that helps preserve produce! 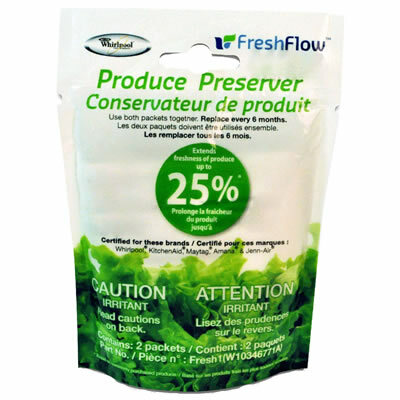 Whirlpool makes another great product called Fresh Flow Produce Preserver. They have a great starter kit, and then also sell refills for it. We sell this product at work for only $12.99! I thought that was a great deal, because if it does work I will be saving more than $12.99 and I will no longer be wasting food or money. To me that is the greatest deal of all. I looked up how and why this preserver works before I made my purchase. While I was researching, I learned that fruits and vegetables give off a natural ethylene gas as they begin to ripen. But as they naturally give off this gas, it makes the produce ripen more quickly, especially when in a small space (like the crisper drawer in the fridge). It turns out that some fruits and vegetables produce more of this gas, and some other fruits and vegetables are very sensitive to this gas and it will cause them to ripen much faster when exposed to high levels. That is why it is also important to separate these fruits into the two separate crisper drawers. 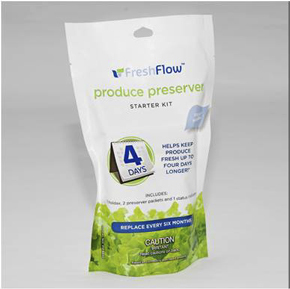 The produce preserver promises to absorb the ethylene gas and lets your produce last up to four days longer. After doing my research on the product, I was almost convinced that this would work, and I was ready to give it a try. I purchased the starter kit that day at work. When I arrived home I took a look at my crisper drawer; I just went grocery shopping so all of the produce was still fresh. This was perfect because now I could truly see how well this preserver worked! It was very easy to install and put together. The starter kit comes with two preserver packets, one preserver holder, and one status indicator. All you need to do is open the holder and place the packet inside, next take the indicator and slide it into the allotted slot on top of the holder. The preserver holder just sticks right onto the side of the drawer, and begins to work. The strip is right on top and turns red as it absorbs the gas to let you know when to change the packets. The only complaint that I had about it was how much space it took up in the drawer- but it isn’t even that much- so I got over it really fast. Ha-Ha-Ha. I was truly happy and amazed how well this preserver worked!! My produce did last so much longer and my fruits and vegetables tasted great even five days later. I got to finish all the produce I bought without having to throw any of it out! This made me ecstatic, because I wasn’t left feeling guilty, throwing any of it out and wasting money!!! So for $12.99 for the starter kit and then just $9.99 for 2 refills I am going to keep using it and save money and food. Overall I would and have suggested it to my family and friends. I suggest my readers should pick one up! Especially if you are tired of wasting food, and money! 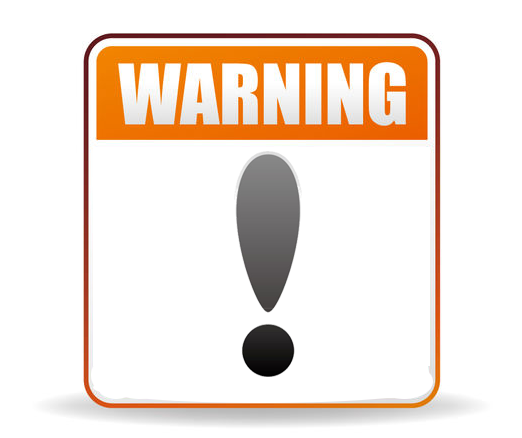 ← Boil Water Faster than Ever!